SUSAN NICHOLSON will be starting her third and final year at the ABC/OHIO Leadership Academy. She is a member of Trinity Baptist Church, North Canton, Ohio. 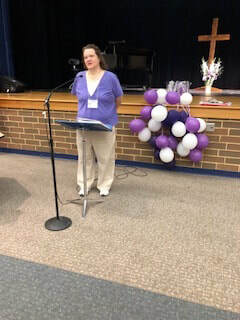 At her church she is a member of choir, church board, BYF, Women's Group, Sunday School Teacher, Children's Leader, Missions Committee and Worship Committee. Susan is also a pianist. She is active in ABC Ohio.